Author(s): Sebastien Alameda, Jean-Pierre Mano, Carole Bernon, IRIT, Université de Toulouse, 118 Route de Narbonne - 31062 Toulouse Cedex 09, France. Sebastien Mella. Background: One of the means to increase in-field crop yields is the use of software tools to predict future yield values using past in-field trials and plant genetics. The traditional, statistics-based approaches lack environmental data integration and are very sensitive to missing and/or noisy data. Objective: In this paper, we show that a cooperative, adaptive Multi-Agent System can overcome the drawbacks of such algorithms. Method: The system resolves the problem in an iterative way by a cooperation between the constraints, modelled as agents. Results: Results show that the Agent-Based Model gives results comparable to other approaches, without having to preprocess or reconcile data. Conclusion: This collective and self-adaptive search of a solution functions like a heuristic to efficiently explore the solution space and is therefore able to consider both genetic and environmental data. 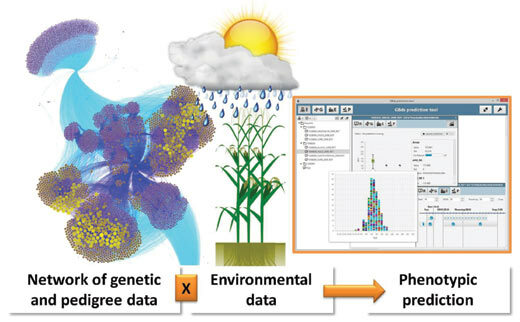 Keywords: Adaptation, environmental data, genomics, multi-agent systems, phenotypic prediction. Affiliation:IRIT, Université de Toulouse, 118 Route de Narbonne - 31062 Toulouse Cedex 09, France. Keywords:Adaptation, environmental data, genomics, multi-agent systems, phenotypic prediction. Abstract:Background: One of the means to increase in-field crop yields is the use of software tools to predict future yield values using past in-field trials and plant genetics. The traditional, statistics-based approaches lack environmental data integration and are very sensitive to missing and/or noisy data.